AUTOMATIC LATHE,Equipped with manual feeder. can produce various kinds of components in brass,metal,Iron,Stainless steel,ect material. AUTOMATIC LATHE,Equipped with automatic feeder. can produce various kinds of components in brass,metal,Iron,Stainless steel,ect material. 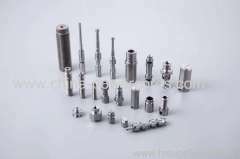 Group of CNC machine service & AUTOMATIC LATHE has been presented above, want more	CNC machine service & AUTOMATIC LATHE and LATHE for produing solid pins, Please Contact Us.